Spam is everywhere be it email, Facebook or even Twitter. You may have come across screaming hype of 20,000+ followers for a specific Twitter account and so on. Ever wondered, how many of these are real Twitter users actually interested in tweets you post? There are lot of spam or fake Twitter accounts created by bots and people with “not so good” intentions. Now you can easily find out number of fake follower accounts following your Twitter account. 1. StatusPeople has created an easy to use tool for finding number of fake and spam Twitter followers following you on Twitter. Just open the Fake Followers Check tool and click Connect to Twitter button. 2. You will get redirected to Twitter website. Enter your Twitter account login details and authorize this app to fetch followers information for your account. 3. After few seconds of processing, this tool with show percentage number of fake, inactive and good followers for your Twitter account. Also, there is option to share this information with your followers on Twitter by clicking “Share your scores” button. This tool take sample (upto 500) from your followers listing. Then this sample data is compared with pre-defined spam account criterion, which is based on simple fact that basic level spam accounts tend to have few or no followers and few or no tweets. However, they tend to follow a lot of other accounts. This tool is a great way to find make of your Twitter audience. More active and less spam Twitter followers converts into effective and result oriented communication on Twitter. Once you login using Twitter and authorize this app, you can also find percentage of fake followers for other Twitter accounts. 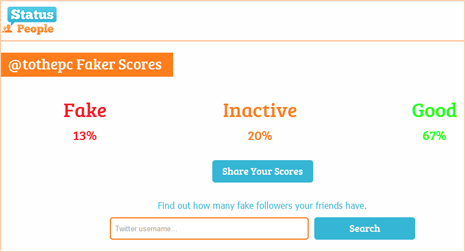 So next time you see a Twitter account with over 30,000+ or more followers, head over to this tool to find percentage of spamers or fakers in that mix.